When you login to your Jackrabbit database, the first thing you'll see is the Executive Dashboard. 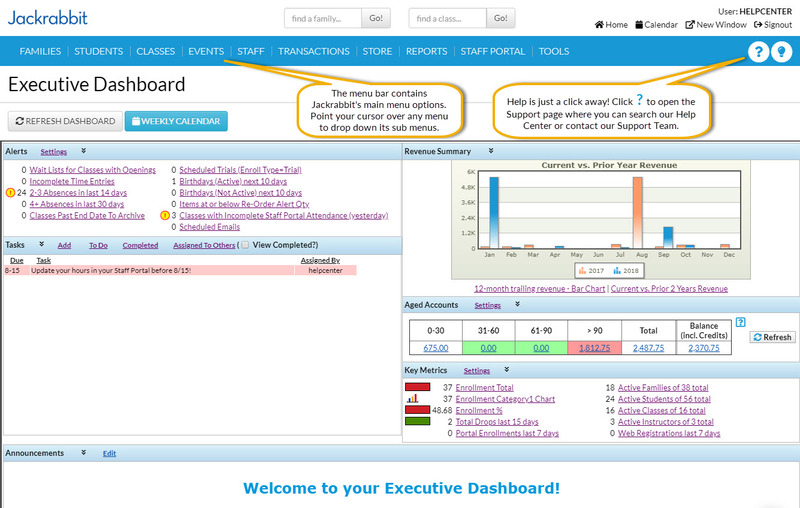 The Dashboard's features are explained in the Help article The Executive Dashboard. You'll want to familiarize yourself with these features later. Jackrabbit's main functions are organized in the Menu Bar. Point your cursor to a menu name to see the menu item's choices. The Menu Bar is located on every screen in Jackrabbit. The Weekly Calendar button on the Executive Dashboard opens a calendar view of your classes by week. This is your class command center and allows you to manage almost all areas of your classes from one screen! See The Weekly Calendar for more details. Jackrabbit has two Quick Search fields. One field allows you to search family name, email, or home or cell phone. The other field allows you to search for active classes. We also refer to them as Global Search boxes. See Search for Information in your Database for more details. Buttons are found throughout Jackrabbit. Click a button to perform a specific action. Tabs are located on family, student, class, and staff pages in Jackrabbit. Tabs are separate areas of organization. For example, clicking the Billing Info tab in a Family's information displays a screen specific to the family's billing details. Links are shortcuts to related records and are displayed in blue text and an underline. Once a link has been clicked, it displays purple. Drop-downs are indicated by a down arrow. When you click on the down arrow, a list of choices displays (drops down). You'll learn how to customize drop-downs specifically for your organization in the Customize Drop-down Lists article.